In part 1 of this series, I discussed the first step in making lasting changes: awareness. You must be aware of a problem in order to make an improvement! If you missed this post, check it out HERE. 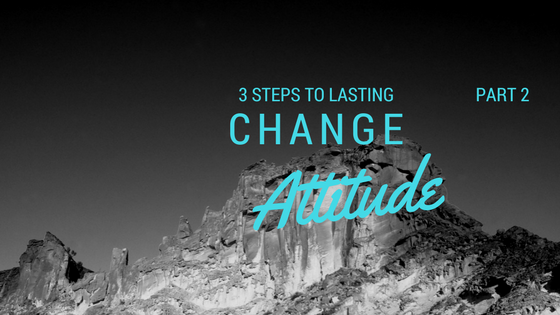 The next important piece to making lasting changes is having the right attitude. First, you have to believe that you are worth the change. If you suffer from low self-worth, you may find it difficult to stay on track to make any improvements at all. But I promise you, you are on this planet for a specific purpose! You were made the way you are for a reason! You are needed, and making positive changes in your life will help you to fulfill your very important, world-impacting roles. If you are solid in your worth, you may still suffer from another attitude blinder, which is believing that you cannot change. Maybe nothing you’ve tried has worked, and you’ve come to the conclusion that your goal is not attainable for you. Well, I’m here to challenge that! Our journeys are not always easy and straight forward, and this means that sometimes “failure” is actually success. This is only true, though, if you keep digging to figure out what works for you! There is typically more than one way to reach a destination, and we are all so unique that whatever worked for your neighbor may not work for you. Sometimes even things that worked for you in the past may not work for you now. But that doesn’t mean you cannot be successful. Do not give up on reaching your goals. Stop believing that you cannot attain the changes you aspire to. There is one final attitude that I’ve come across, and to be brutally honest, I’ve found it very difficult to work with people who fall into this category. I am referring to the people who are always negative and think the world is against them. They stew in their problems, and some even seem to thrive only while living in misery. Hear this: Your words and beliefs are powerful! Scientific studies have proven that your thoughts can heal you or harm you. If you keep saying that you’ll never improve, I guarantee you that you’re right. If you want to heal, you need to speak and believe healing. If you want to change, you need to stop believing that everything is working against you. You are in control of your thoughts, and your thoughts impact your outcome. Take charge. 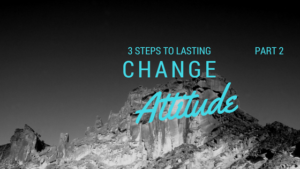 I urge you to consider the importance of attitude in making lasting changes, and I encourage you to take some time to search yourself for any negative attitudes or beliefs that are preventing you from success. Be on the lookout for the last article in this series when I discuss the final step to lasting change: action.